Oh yeah, it’s cold out there. Snow has fallen. Ski season has started. You’ve packed your bags and you’re all geared up for a winter experience. But have you considered that you could experience a little summer with your winter? No. Well consider this … you can! Right here in the Eastern Sierra – Bishop’s big backyard is a playground for outdoor enthusiasts who want to experience it all. You could ski in the morning and play golf in the afternoon. Or you could ride pow then ride a mountain bike trail. Mix a day on the slopes with a day among the rocks. Go for all out action then mellow out on the banks of the river and … catch your dinner! Days are frequently warm and sunny in the Owens Valley and Bishop gives you options for a multi-faceted winter/summer experience. It also offers an escape for the more cold-averse members of your group. Bring ‘em to Bishop and let ‘em thaw out and experience some summer fun in wintertime. 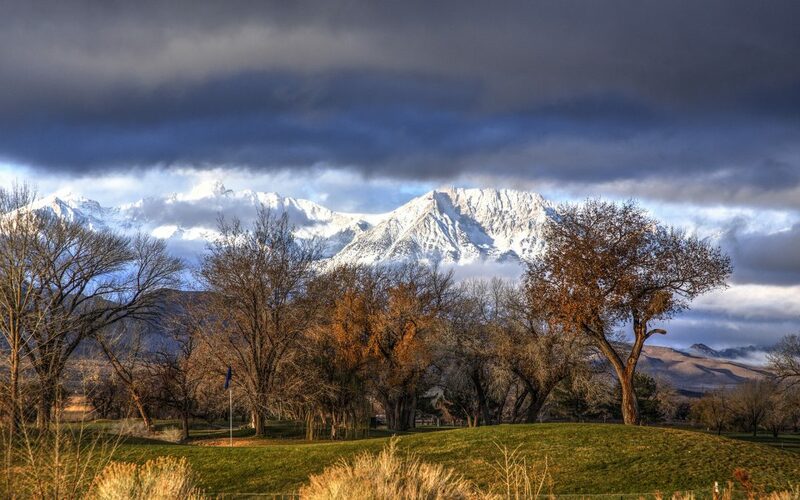 Set in the broad expanse of the Owens Valley with the snow capped Sierra Nevada to the west and White & Inyo Mountains to the east, the Bishop Country Club is open to the public and enjoyed throughout the year – weather permitting. Most winter days are bright, clear and crisp and a round of golf on this 18-hole championship course is an experience not to be missed. The fairways are picturesque, the views are uninterrupted, the scenery is spectacular and the winter weather can sometimes even be balmy. The Bishop Country Club course is well suited to both beginners and experienced golfers alike. It’s a wonderful spot to test out some new skills or put your already good skills to the test. Whether you’re a scratch golfer or just getting into the swing of it, PGA Pro, Steve Shibley, can help you with your game and fine tune your swing. The Pro Shop has all you might need for a round of golf, from full sets for rent to additional gear for purchase. It’s a super shop for great golfing gifts. So in case you’ve forgotten it’s the wintertime holiday season (while you’re out there enjoying some summertime fun) you could get some last-minute gifts for your favorite golfers. The shop also offers demo clubs to try out and while you’re in the gift-giving mode, perhaps get yourself a holiday gift. Nothing says holidays more than doing all the things you love. Now go out on the hill and shred the white stuff, then roll on down to Bishop and land one on the green. Pro Tip: Golf balls fly further at higher altitudes. Check out this excellent article by Titleist and then come and see for yourself what happens in the high desert of Bishop. 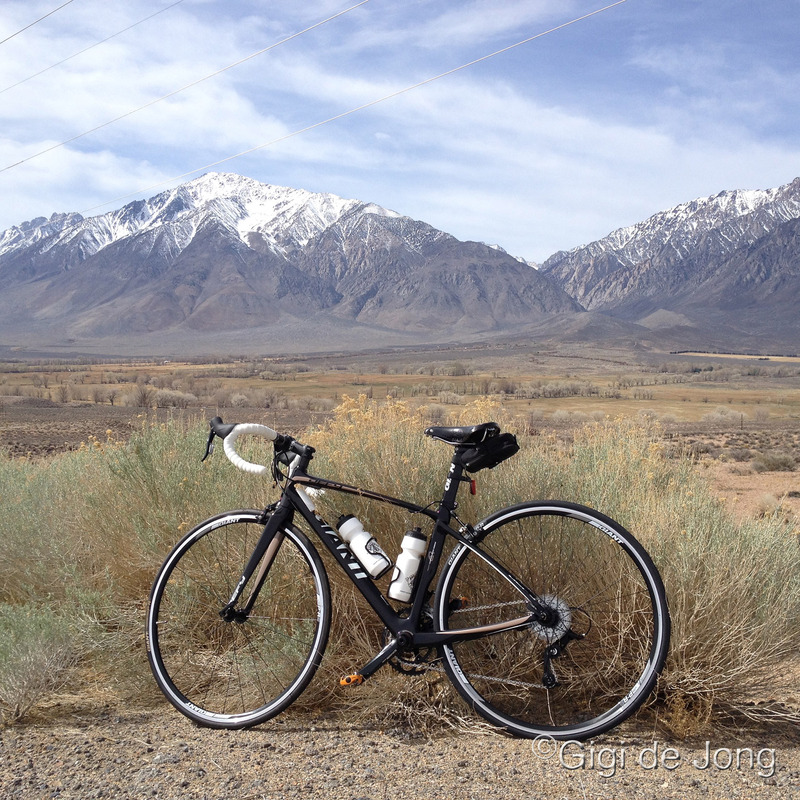 Winter is one the best times of year for cycling in the Bishop area. The days are frequently warm and sunny and perfectly suited to road riding and mountain biking. When you pack your bags and load up your skis and boards, toss in your biking gear and load up the bikes too. There’s a plethora of trails in the foothills of the surrounding mountains, and the roads around Bishop are scenic and quiet. Some of the mountain biking trails are gnarly, leg-pumping, heart-pounding thrill rides for all you thrill seekers out there. Others are smooth, sweeping rides that let you feel the rhythm of the trail. Yet more are easy, low-energy rides along paths and tracks where you can take the whole family for a few hours of fun in the wintertime sun. After a day on the hill, skiing or snowboarding, an awesome way to restore your mind and body is through the rhythmic cadence of a road ride. In little more than an hour you can achieve the benefit of a cool-down ride or spend a sunny afternoon on a hill climb workout. There’s no limit to how many ways you can tackle the hills of the Eastern Sierra. 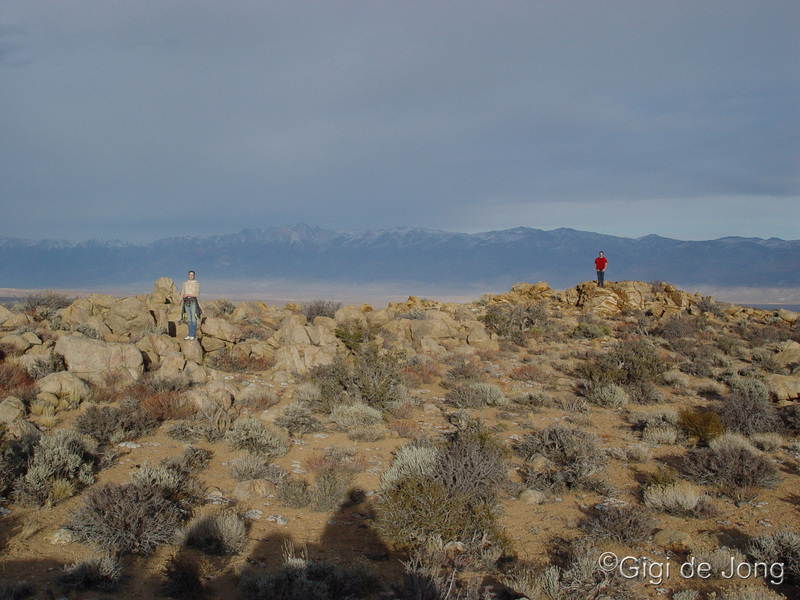 Take a look at these previous blogs for more specifics on winter mountain biking and road riding around the Bishop area. Pro Tip: Remember that even if the day is warm it’s very likely that at some point during your ride you will descend a hill and then the wind chill will be a significant factor. Dress in layers and suit up before you start the downhill – with special attention to keeping your hands, feet and chest well protected. 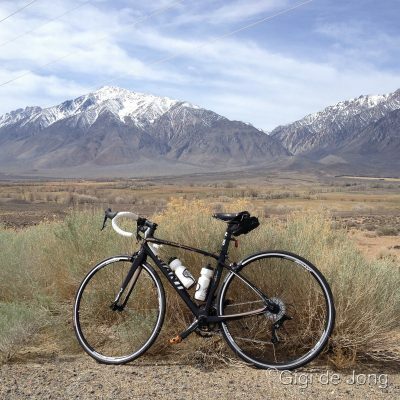 For bike tune-ups, gear, and biking advice visit the folks at Aerohead Cycles in Bishop. If you thought hiking the Eastern Sierra was not an option in winter – you thought wrong. Often in winter the air is warm and the sun is bright and hiking the foothills of the mountain ranges to east and west of Bishop is a unique and special experience. There are hiking options less than 20 miles from town and yet the feeling of space and the sense of solitude is restorative. Expand your horizons up on the rocky outcrops of the Tungsten Hills. This fascinating geological feature composed primarily of granite and quartz diorite was mined for tungsten until the late 1940s. Nowadays it’s a favorite place for rock hounding where crystals of red garnet can still be found. The views are breathtaking with vistas in every direction from the numerous peaks. Survey markers can be found on many of the peaks and two of these, the Tungsten Point and the unnamed Tungsten Hills highpoint, have summit registers. So if you’re a peak bagger, you should definitely add these to your list. Hike the Owens River Gorge in winter. When the temps are low and the snow is high in the upper elevations, drop down into the Owens River Gorge for warmth, protection, and a very different view of the Eastern Sierra. The river runs clear and deep and the gorge is a magnificent riparian habitat with an increasing biodiversity. From the lip of the gorge the hike down follows a paved road up to the hydroelectric power plant at the river’s edge. As the sheer cliff walls rise up on either side, the road peters out to become a dirt track and further upstream you’ll come across the skeletal ruins of a now derelict power plant. Here you’re likely to see climbers testing their skills on these vertical walls and hear the tumbling call of the canyon wren. Hiking alongside the waterways of the Owens Valley is a full-on family fun wintertime experience. The terrain provides little elevation change, but has an almost limitless number of miles of diverse tracks and trails. Between the Pleasant Valley dam and Tinemaha reservoir the Owens River twists and turns for 40 miles. The tracks and trails undulate alongside the river over grassy banks, between tall reeds and over sand dunes. You can make it leisurely or energetic and yet always sublime. Birdlife is abundant and of course the fishing is fantastic (more about that coming up below.) A walk along the shores of Pleasant Valley reservoir is easy and quiet. The road is closed to vehicle traffic and it’s a great place for an early morning or late afternoon stroll. The canals around the outskirts of town are a great place to let kids and dogs romp. The recently restored Buckley ponds have access for the physically disabled to be at the water’s edge to fish or just enjoy the view. Pro Tip: Even though you may only be a few miles from town, be prepared for the ruggedness of the Eastside. Take the same precautions you would for hiking in the mountains, such as: sufficient (perhaps extra) food and water, a compass or gps (remember cell signal is not 100% everywhere here), dress in layers, and always – especially in winter as sunset is pretty darned early – take a flashlight with sufficient battery power. Get maps, gear, and gadgets at Eastside Sports on Main Street. Trail runners who know … know that Bishop, California is trail-running heaven. Last year Bishop was rated one of the 8 great top trail running mountain towns on the North American continent in the September issue of Trail Runner magazine. It certainly is #1 in our book for wintertime trail running. If your regular running routine keeps you on the road and among the cars and crush of city life, take advantage of your winter mountain getaway to run among the rocks and brush of the Eastside. Or if you feel the need to shed the layers of snow gear, strip down to your base layers and run unencumbered for a couple of hours, then Bishop is where you shed the city and run wild. From the wide-open terrain of the Owens River valley, to the rocky outcrops of Buttermilk Country, the Tungsten Hills, and the Volcanic Tablelands, trails vary in length, grade, terrain and altitude to provide something for everyone. Whether you’re a beginner or seasoned trail runner, running here provides the perfect balance of exercise and rhythmic meditation. Combined with stunning views of this magnificent landscape and a closeness to nature, trail running can recharge your body and mind. Take a look at these previous blogs for details on some ‘must-do trail runs’ and ‘the good, better, & best’ of trail running in the Bishop area. Be aware that areas at high elevation will be inaccessible during deep wintertime. Pro Tip: Experienced and adventurous trail runners can use specialized crampons that fit on lightweight footwear or carry a small aluminum ice axe for snowy, icy sections that you might encounter at higher elevations. Get all you need for a great trail run experience from the pros at Sage to Summit in downtown Bishop. Bishop has long been considered a world-class fishing destination and is best known for magnificent fly-fishing in both the valley low and the mountains high. 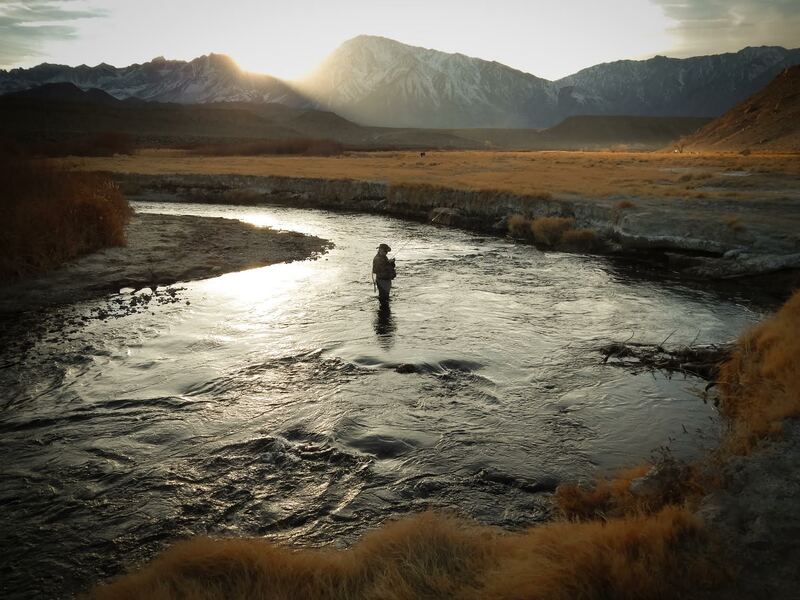 But, did you know that fishing in the Lower Owens River is legal all year long? Miles of canals, large reservoirs and protected ponds in the Owens Valley, some offering handicapped-accessible fishing piers, hold the promise of exciting winter fishing with fly, lure or bait. In these waters carp, bass, bluegill and catfish (in addition to trout) will test your angling skills and raise your opinion and appreciation of them. Rainbow and brown trout swim the river and the warm water fish are in the Buckley and other ponds. Most riverbank fishing spots are easily accessible by car so come on down from the cold to where the warm sunshine of a Bishop winter afternoon thaws your body and lets you cast your line for a great variety of warm water fish. Perhaps you might even catch your dinner. Better still, perhaps you might teach a youngster the art and skills of fishing and instill in them a love for the sport. What’s more – Bishop boasts a world of good food with restaurants serving great meals, drinks and a good helping of entertainment with wait times for tables short to non existent. Many establishments are family friendly and most serve a great selection of adult beverages. We just ask that you designate a driver. 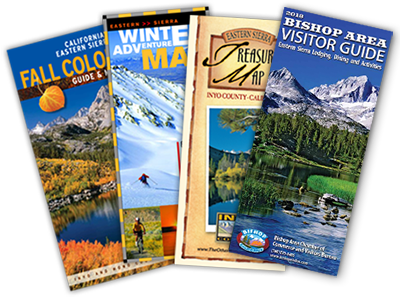 Call the Bishop Visitors Center on (760) 873-8405 or visit our website at www.bishopvisitor.com for more information on what to do, where to go, and how to get a great deal more out of your winter holidays. 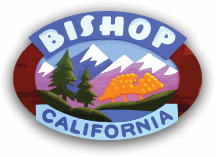 Be in Bishop this winter. Be an Outsider.